Dogs are "den" animals and a properly used crate will become a safe, comfortable home for your dog. 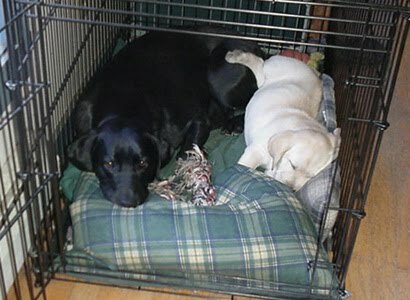 The crate helps in housetraining since puppies do not want to eliminate in the sleeping area. The proper use of crates is similar to the use of cribs and playpens for infants and small children. Crating your puppy when you are not watching him prevents damage to household items, prevents electrocution from chewing through electrical cords, and prevents poisoning by ingestion of household chemicals. Use a crate that is the right size for your puppy. Do not crate the puppy as a punishment. Do not leave your puppy in a crate for long period of time. The puppy will learn to associate the crate with quiet times and naps. The puppy should be in the crate at naptime and bedtime. Your puppy will need to go outside immediately after awakening and as soon as you return home. If the puppy is barking and whining because he doesn't want to be in the crate, do not let him out. You will be rewarding and reinforcing this behavior. Wait until the puppy is quiet before opening the door, and then praise him while you open the crate door. Puppies do not always like the crate initially and some training is required. Method 1: Introduce the puppy to the crate gradually. Before you crate your puppy, take him outside to eliminate. Be sure to use a positive tone of voice when you put the puppy into the crate. Give the puppy a small treat and a safe chew toy. Put the puppy in the crate without closing the door, sit on the floor next to the crate, and play with the puppy. The children can help too. Start with short intervals of 2 to 3 minutes with the crate door closed. Gradually increase the time the puppy is in the crate. Method 2: Before you crate your puppy, take him outside to eliminate. Gently but firmly put your puppy in the crate. Give the puppy a small treat and a chew toy. Walk away. Let the puppy out of the crate when he cries, whines, or barks only if your puppy needs to eliminate. The effects of separation from littermates are often lessened by putting the crate in a bedroom where a family member sleeps. The puppy is not accustomed to being alone and your presence will help him adjust. The first 2 or 3 days are the worst. Bringing the puppy into bed with you for a night or two often reduces the anxiety. The puppy can them be moved to the crate next to your bed. For a few weeks, the puppy may need to go outside during the night. Most puppies can go through the night when they are about 12 weeks old. How Long Should your puppy/dog be in a crate? Little puppies should not be left in a crate for more than 3 hours at a time. If there is no one at home during the day, arrange for a neighbor or a pet sitter to let the puppy out. A 3 month old puppy should not be crated more than about 4 hours at a time. A 4 or 5 month old may stay in a crate for up to 5 hours. Six to 12 months old puppies may be left in a crate for up to 6 hours. Dogs of any age should not be crated for more than 7 to 8 hours without a brief break. A wire or plastic exercise pen can be securely attached to a wire crate or set up around the crate. The puppy will have a crate to sleep in, a place for a water dish and a place to eliminate. Newspapers have been used for this purpose for years. A bin with wood shavings will also work well. There are several companies that markets a litter pan designed for dogs. The pan can be filled with wood shavings or products specifically designed for dogs. This set-up works well for working families that are away from home for an 8 hour work day. However, little puppies get lonely and anxious, and they need human interaction. If you use this setup while you are at work, arrange for a midday pet sitter to provide your puppy with food, fresh water, playtime, and brief walk outside until your puppy is at least 6 months old.